d = fdesign.fracdelay(delta) constructs a default fractional delay filter designer d with the filter order set to 3 and the delay value set to delta. 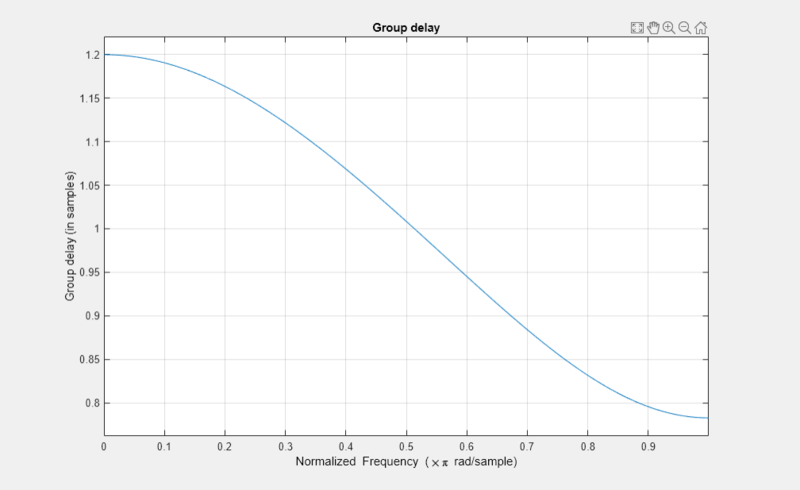 The fractional delay delta must be between 0 and 1 samples. d = fdesign.fracdelay(delta,'N') initializes the filter designer specification to N, where N specifies the fractional delay filter order and defaults to filter order of 3. Use designmethods(d) to get a list of the design methods available for a specification. d = fdesign.fracdelay(delta,'N',n) initializes the filter designer to N and sets the filter order to n.
d = fdesign.fracdelay(delta,n) assumes the default specification N, filter order, and sets the filter order to the value you provide in input n.
d = fdesign.fracdelay(...,fs) adds the argument fs, specified in units of Hertz (Hz) to define the sampling frequency. In this case, specify the fractional delay delta to be between 0 and 1/fs. Design a second-order fractional delay filter of 0.2 samples using the Lagrange method. Implement the filter using a Farrow fractional delay (fd) structure. Design a cubic fractional delay filter with a sampling frequency of 8 kHz and fractional delay of 50 microseconds using the Lagrange method.